I warmly welcome the demolition old Moffett’s building on Downshire Road, Holywood which many people regarded as Holywood’s ugliest building. The building was bulldozed at the weekend and is now a pile of rubble. 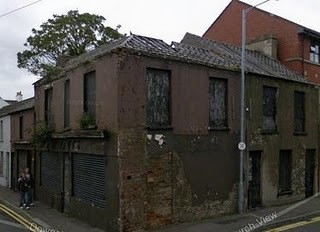 Moffets’ Building has long been a blot on the landscape in Holywood, gradually falling into disrepair until its current awful state. A number of people raised the state of the building with me and directly to Council officers. In response North Down Borough Council took strong action and served a notice against the owner, requiring him to demolish or re-instate the property. It seems that rather can carrying out significant works which would have included removal of vegetation from the building, re-instating the roof, repairing or replacing brickwork, repairing window sills and repairing or replacing any damaged window openings and doors the owner opted for demolition. Planning Permission was obtained in 2007 for demolition of existing building and construction of new ground floor dental manufacturing and first and second floor office building, at 2-8 Downshire Road / 55 Church View, Holywood. The application was approved on 17/7/07. The approval is valid for five years and expires on 17/7/12. My next focus will be to ascertain when building work will commence in order to ensure we are not left with a empty plot of land for years.